I get around a lot, but Tokyo is one massive megalopolis, so there are inevitably parts of town I don't find myself in too often. One of those areas is Odaiba, one of the artificial islands sitting in the water at the edge of this other city by the bay. 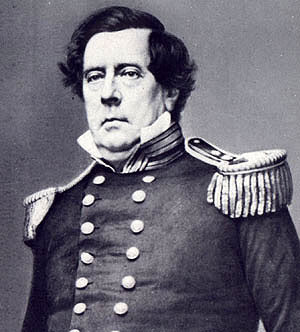 In 1853 Commodore Perry rolled up with his "black ships", big American boats armed with cannons, and said to the last of the Tokugawa Shoguns, "open up your ports to us...or else." Although this marked for the beginning of the end for Tokugawa rule and the beginning of the beginning for Japan's movements towards nation-state status, the Tokugawa at least took precautions to make sure other countries couldn't use the same kind of gunboat diplomacy. Hence, the building of the maritime fortress islands of Odaiba in 1854. Fast forward 150 or so years. Odaiba is now essentially one big floating mall, housing multiple massive American-style indoor shopping complexes, entertainment facilities, and a TV station. I mean what was Tokyo going to do, NOT turn this floating bulwark against foreign invasion into a massive center for conspicuous consumption? 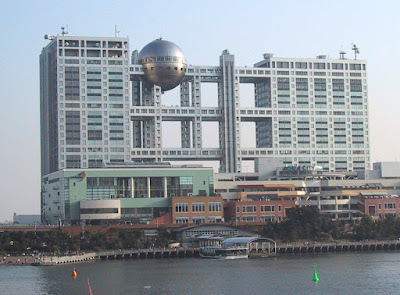 So yeah, I'm not such a big fan of Odaiba. But sometimes it's sheer ridiculosity manages to even out do itself, like when they manage to line up a view at once encompassing the fake Liberty Bell, the fake Statue of Liberty, the fake Brooklyn Bridge, and the fake Eiffel Tower. 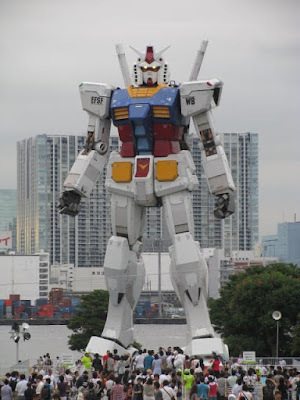 Or like this summer when they built a life-sized Gundam robot to bring a message of environmental awareness to the people of Tokyo. "For 30 years, Gundam has been saving the earth, but now it's your turn. You can start by unplugging your fridge when you go on vacation and using low-flow shower heads." No, really. But until mid-April you've got an even better reason to visit Odaiba - the Odaiba Ramen Park, a four month event in which various famous shops take turns setting up stalls on the patio outside the Fuji TV station. The current iteration lasts until I believe January 11th, after which a new batch of shops will take over for another month. The Odaiba Ramen Park event seems to be a response to the Great Tsukemen Festival, at which I got to spend a day in the kitchen with the team from Ivan Ramen. That event was sponsored by TV Asahi, so this seems to be Fuji TV's competing event. 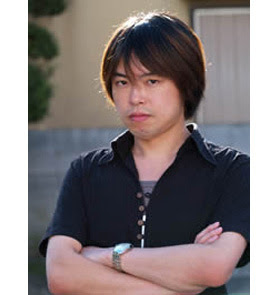 This time around, the man picking the shops is Ishigami Hideyuki, one of the more visible critics on the scene. Definitely an omnipresent media personality, Ishigami fashions himself as the kind of bad boy ramen critic, rarely smiling and using the rhetoric of general badassery to express his thoughts on noodling. He came to prominence as the ramen judge for the TV Champion show, which has christened many popular shops and thrown them to superstardom. Honestly, he strikes me as a bit of a wiener, but let's see how his pics at the Park play out! Check Keizo's blog for the full rundown of shops. Keizo and I rode the monorail out to the island one morning to be there when the park opened at 11. Compared to the maddening crowds of the Great Tsukemen Festival, this was a much more laid back affair, mostly serving those already in Odaiba and a few freaks like us willing to trek out for our fix. We strategized for a minute, then decided on what our first bowls would be. I hit up Gen'ei, a Fukuoka-based shop famous for their experimental creations as well as their straightforward Hakata tonkotsu (pork bone ramen). Gen'ei are the guys who provided the soup half at the limited time only shop FUTO, though I didn't realize that at the time. Being early, I had a chance to chat with the cooks for a few minutes while I waited for my bowl. When that bowl came out it looked a bit like this - hand-kneaded noodles sitting in a light shio (salt) soup made fragrant with shrimp oil and broth, topped with a few delicate slivers of onion, chili, and greens, as well as pork short ribs that went straight into Keizo's belly. The soup was mild but complex, and had a kind of "Asian" flavor for lack of a better word. What really made it was the secret ingredient of Kabosu, a rare citrus fruit found in Northern Kyushu - the dash of tangy yet sweet acid brought it all together. But the noodles really took it to another level. Very fresh and soft yet chewy, I watched the crew hand knead them before my eyes. Some of the best of the day, these convinced me that when I finally make it to Fukuoka I gotta be sure and stop by Gen'ei. Big thumbs up! Let's see what Keizo is bringing back for his first bowl! He's got a bowl of tomato ramen from Menya Shichisai, topped with some "high collar" cheese. The Shichisai shop serves some absolutely fantastic shôyu (soy sauce) ramen with top notch noodles, but this was merely tasty. Satisfying, but it really just tasted a lot like ramen noodles in tomato soup. I got much love for Shichisai, but I expected a bit more from the high standard they set at their head shop. There's a lot more noodling to come, so stay tuned for round two of Odaiba ramen reportage tomorrow!